Applications can only be submitted in English online on the official website www.fedora-circle.com. The applying team must designate one contact person representing the lead Opera House/ Festival where the new opera or ballet creation will be staged in 2017/2018. This person is in charge of submitting the complete application online and must remain the key contact person of the project for FEDORA and the FEDORA Prize sponsors. 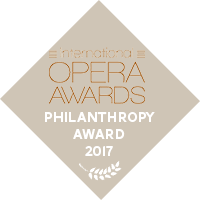 The lead Opera House/ Festival is in charge of managing the FEDORA Funds and responsible for submitting activity reports about the actual fund investment. The winner of the FEDORA Prizes will sign a contract on behalf of the co-producing partners with FEDORA. This agreement document outlines the terms and conditions of the transfer of the FEDORA Funds, FEDORA membership of the co-producing partners and communications. Innovation: What is innovative about the opera or ballet creation? Differentiation: How does the opera or ballet creation differentiate itself? Relevance: In what way is the content and artistic work relevant today and in the future? Inspiration: How can this work inspire artists and audiences? Feasibility: Is the realization of this project realistic, especially regarding budget and partners involved in the project? Sustainability: How high is the probability that this opera or ballet creation will be staged and re-produced in the future?